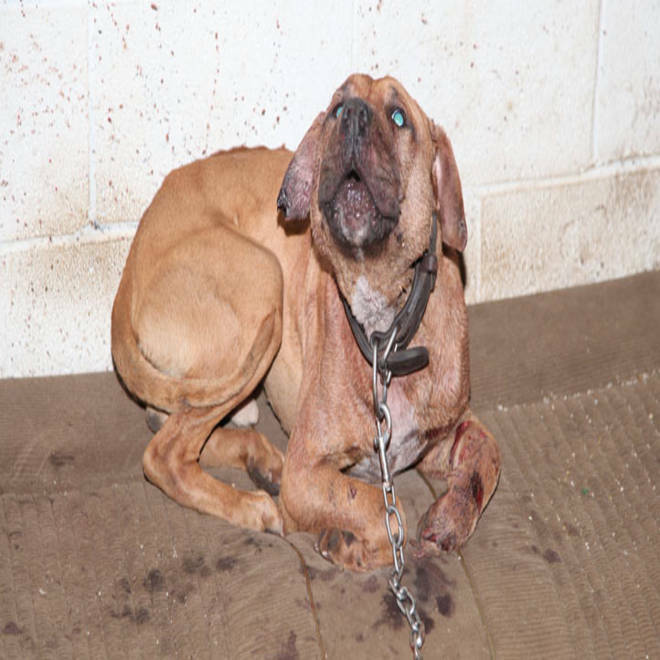 Eight men were being questioned and at least seven dogs were rescued after Dolton, Ill., police and Cook County Sheriff’s Police officers broke up a what was described as a major dog fighting operation Wednesday night. "This was going to be much more extensive," said Sheriff Tom Dart. "There were cars from out of state there. So this was a large operation that was going to go on that night." Two men were arrested immediately, as police raided a former auto repair garage in the shadow of the Bishop Ford Freeway. But a search of the building revealed more suspects, hiding in the building’s rafters. "We found six more people, one of whom has a warrant out for an attempted murder case," Dart said. The sheriff said it appeared some of the dogs had already fought by the time officers arrived. One had severe bite marks and a wounded eye which medical personnel said may have to be removed. The fighting ring itself was splattered with blood, as were the walls of the garage. A worn out vending machine in a corner contained narcotics investigators believe were used to sedate the dogs so they could continue fighting. Dart said it was unclear whether the dirty garage had been the site of previous fights. "The walls inside the facility are covered in blood," he said. "It’s hard to tell if it’s new or not." Investigators said when they arrived, the sound of the fighting echoed through the parking lot. "You could hear the yelling and the barking," Dart said. "You could hear them cheering on their dogs, and you could hear the dogs fighting." One of those questioned had recently been released from jail after being charged with dog fighting, an officer said. Another had an outstanding warrant on an attempted murder charge. Dog fighting exists in a shadowy world which is often difficult to detect. The fights are often advertised word-of-mouth or in online advertisements which are closely held. For that reason, Dart said his investigators were lucky to have raided the building when they did. "They move these fights around a ton," he said. "We’ve had numerous ones where we show up at a location, and it had been moved hours before." Members of the South Suburban Humane Society took the dogs. This dog was found after police broke up a suspected dog-fighting ring in Dolton, Ill.